It's that time of year when plastic eggs abound. There are lots of great ideas out there for using them as a learning material. This week I made a set of these for my students in my classroom to practice their spelling words. They enjoyed it so much, I made a set for Big Brother at home too. For each grade level I typed their spelling words and then printed them onto card stock. I then cut up the letters of each word and placed the letters into a plastic egg. I put all the eggs into egg cartons to both organize them and make it more fun. Students worked with a sheet with all their spelling words. When they "cracked" an egg they had to figure out what word it was and then spell it correctly. In the set for home I used short consonant-vowel-consonant (CVC) words. I wrote the words on the outside of each egg and also on small strips of card stock. Just like before, I cut the words apart and put them into each egg. As Big Brother is too little to sound out words yet, his activity is really more about matching letters to build them in the right order. I would tell him the word as he worked on it. I modeled how he could make the letter sounds, but I didn't take it much further as he is still a little young for that. However, this could be a great activity for kindergartners and early first graders. 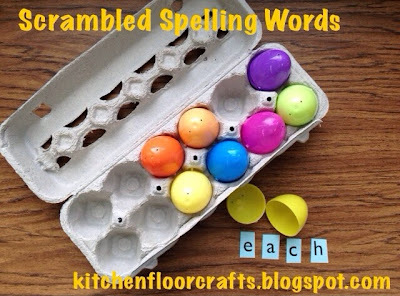 If you've got kiddos who are reluctant to practice their spelling words at home, this is one way to make it fun. It involves needing to recognize the letters of the word, spell it out, and sound it out as it's spelled. 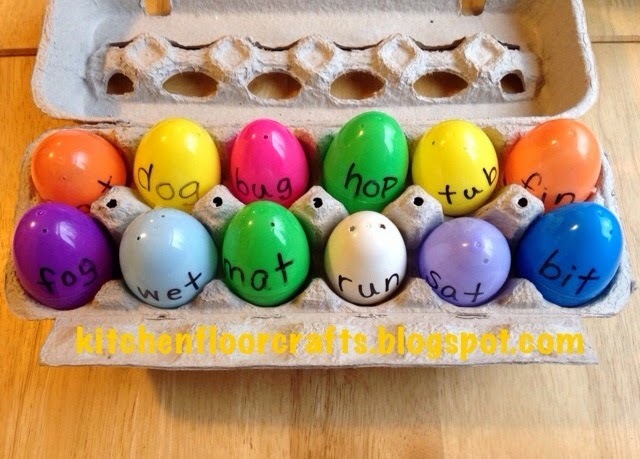 It's also a great way to continue to use those Easter eggs even after the holiday has passed. 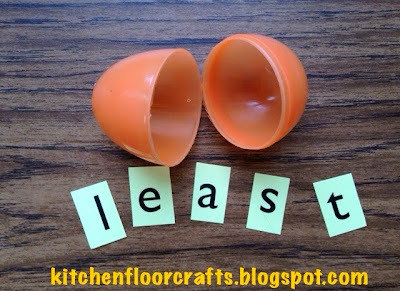 Looking for some other ways to use plastic eggs? Check out these Eggcelent Ideas from Got Kiddos? 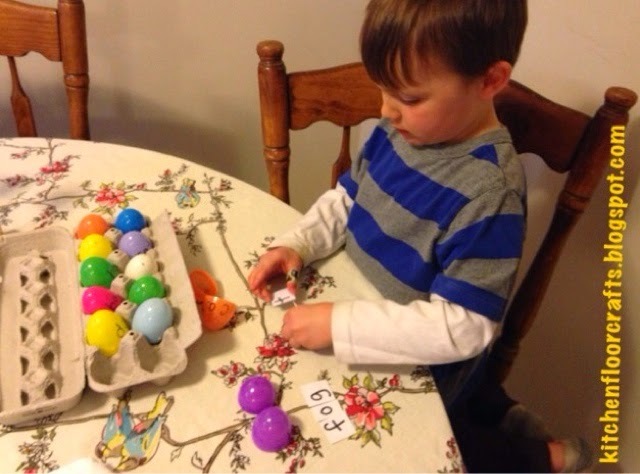 or these 10 Ways to Learn Numbers and Letters with Plastic Easter Eggs from Reading Confetti.